My non-writing friends may think I have gone nuts, but I’m sure my writing friends will be able to relate. 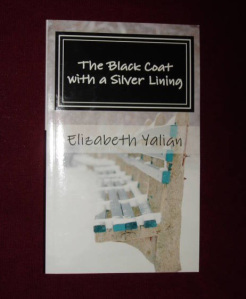 Creating Nick, the main character of Black Coat with a Silver Lining has been touching, rewarding, entertaining, educational, and enlightening. I wrote about compassion, love, humanity, struggles, betrayal, family, abandonment, heartache, poverty, hunger, self-bashing, foster care, faith, God, grace, forgiveness, everlasting peace, and the carnage caused by self-centeredness and divorce; and I learned about homelessness, missions, getting arrested, and going to jail. Overall, I wrote about the consequences one person suffers because of someone else’s decisions and choices.